On September 30 at Prefectural Government office, president of Okinawa Ham Co. Ltd. Norikatsu Nagahama (the second from right) and the company staffs promoted Benikojisu. Okinawa Ham Co. Ltd. (OkiHam) created “Benikojisu” which consists of rice malt, Ryukyu Moromi Vinegar, and gamma-aminobutyric acid (GABA). Working with the Okinawa Industry Business Association, the company will test-market Benikojisu on wealthy consumers in Taiwan from mid-October to February 2015. OkiHam used rice malt from Gunze in Tokyo, Ryukyu Moromi Vinegar from Kumesen Brewing Company, and their original GABA. 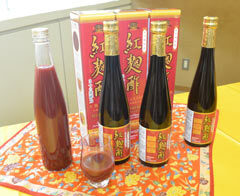 New product of Okinawa Ham "Benikojisu" to be targeted at wealthy consumers in Taiwan. The company has developed the product with support from the 2014 Smaller Business Problem Solution Regional Collaboration Project of the Prefectural Industry Promotion Corporation. A 500 millilitre bottle of Benikojisu costs 1,800 Taiwanese dollars, which is about 6,120 Japanese yen. In Japan, one bottle will sell for 3,240 yen, including tax. Through Taiwanese importers, the company will sell the product at 60 to 70 local stores such as pharmacies, department stores, and mass retailers. Its sales target in Taiwan is 6,000 bottles by February 2015. In Okinawa, the company will sell the product at Takarajima, a store belonging to the association. It also plans to make it available at pharmacies and mass retailers in the future. The sales target in Japan is 2,000 bottles.